Most anyone these days has a digital camera and a computer. Over the years, we take thousands of digital photos of our family, birthday parties, vacations and exciting events. Now you can use all these pictures creatively to make a compelling photo slideshow screensaver that will remind you of the best and most enjoyable moments of your life when you’re having a break in the office and leave the mouse for a while. For example, the screensaver can display pictures of your family and children, photos of your beloved, or pictures of the favorite dog. Animations like that can help you personalize your desktop space and satisfy the passion for self-expression. Photo Slideshow Creator makes it incredibly easy to make a photo slideshow screensaver. Using the supplied library of transition effects and slideshow themes, you can make your first project in minutes. Below is a brief explanation how to make a photo slideshow screensaver in Photo Slideshow Creator. To begin the process, you need to bring the photos into the program. An easy-to-use file explorer lets you add new images to the slideshow timeline quickly with a few simple drag-and-drop operations. 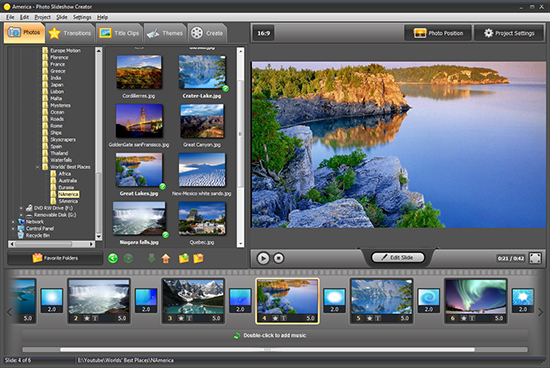 When the pictures are arranged into the slideshow, you can preview the result in the built-in player and make changes if necessary. For example, you can replace default transitions between the slides with the ones of your own choice. Now comes the time to make the slideshow more prominent and professional. For this purpose, you can use pre-made slides that can help you start and end the slideshow and arrange pictures into logical and meaningful parts if you insert them between the photos that represent different topics. Though the slides have their design with the predefined background and sample captions, the program lets you edit them the way you want. What’s more, you can apply a variety of beautiful skins to give your creation a professional look. You can, for example, apply the theme that displays your honeymoon photos in a fancy frame with flowers around and ocean scene in the background. Other themes include the ones that display your pictures on the virtual screen such as the screen in the movie theater, street ad banner, laptop monitor, and school blackboard, to name a few. The last thing to do is to package and save the slideshow. For this, go to the CREATE TAB and select CREATE SCREENSAVER. That’s it. The program processes the project and saves the result to the output folder you selected. In just a few seconds, you’ll see the invitation to run the slideshow you just created. This is how to make a photo slideshow screensaver in Photo Slideshow Creator. As you see, it’s not rocket science. Photos capture precious memories of our life. Before Photo Slideshow Creator, you’d just save them to one of the folders on your PC and forget. Now you can bring those memories to life again and have them running on your computer as a screensaver, bringing you lots of joy and happiness every day! Make the best slideshows with Photo Slideshow Creator!